Classroom listening libraries remain a valuable literacy resource for K-5 students. However, outdated resources and budget constraints have left many teachers searching for a change. Are you tired of the traditional classroom listening library setup? Are you interested in bringing your classroom listening library into the 21st century? Learn several innovative ideas to transform your traditional setup. Read firsthand experiences from teachers who have implemented new technology in their classrooms, and learn about some of the successes and challenges experienced during the transition. The Lansingburgh Central School District is an urban district located in the North end of Troy, NY. The district services students in grades PreK through 12. The Turnpike Elementary School population is 658 students in PreK through Grade 2, where class sizes range from 17-25 students per class. Lansingburgh is a diverse district, consisting of 60% Non-Hispanic White, 18% Black or African American, 13% Hispanic or Latino and 9% of families who identify as other. We have a growing population of English Language Learners, which is currently at 2%, and 16% of our students have disabilities that impact their academic achievement. In addition to the social and academic interventions our students need, they also need to be engaged in a challenging curriculum that is personalized to their unique needs. To prepare students for this world is a daunting task for teachers, and it is important that we shift our teacher mentoring and current classrooms and curriculum to reflect this need. Teachers in Turnpike Elementary School (PreK-2) had expressed a number of challenges over the years with the traditional listening station format, which consisted of cassette players or CD players with student headphones. CD players frequently broke, or students had difficulty using them independently. This resulted in a loss of instructional time as teachers were frequently called away from a small group to troubleshoot the technology. When CD’s became damaged, teachers were often upset to find that some of their well-loved listening station titles were no longer available for re-purchase. Additionally, our building faced the challenge of eight classrooms per grade level team. Some classrooms may have had copies of a CD that was great for a listening station, but rotating that same CD through multiple classrooms in a week’s time posed a true challenge. Also, as new titles were released, teachers often lamented, “I wish I had this as a listening center!” Conversely, when a new unit was introduced into a grade level curriculum as a result of changing standards, some teachers found themselves with no existing content resources to use in a listening station. As more technology resources were added into our classrooms, such as SMART Boards and Chromebooks, teachers wanted a method to incorporate these technologies into classroom instruction. Students loved the experience of listening to a book with the use of a document camera or on the SMART Board via a streaming service. This provided them with an exposure to repeated reading of a text, and to different reading styles. With all of the pre-existing resources available on the Internet, our teachers wanted to integrate them more readily as a part of the curriculum. We knew that listening libraries remained important, in spite of some of the challenges that were discouraging teachers from using them on a daily basis. We were confident that students could reap the many benefits of the use of an updated listening station such as increased vocabulary exposure, heightening of student listening skills, and opportunities for multisensory learning. Epic! Books for Kids: With a free teacher-based subscription, teachers were introduced to options for use of Epic! in the classroom. Based on age level, teachers could create individual student accounts and select specific titles for each student to access, or create a general classroom account where students could select their own titles for listening. This option engaged students by incorporating student choice, and allowing students to choose titles based on interest. Some teachers chose to utilize Google Classroom to push out book selections and asked students to complete a graphic organizer or written response after listening to their selected titles. YouTube Playlists: Teachers were taught how to create YouTube playlists based on unit, theme, or interest. Teachers were also shown how to share playlists so that curriculum-based playlists could be shared across all teachers at a grade level. Examples of teacher-created playlists included a “Classroom Favorites” playlist, an Eric Carle playlist, and an apple-themed playlist. This format allowed teachers to include newly released titles or titles from a favorite author that s/he did not have time to read to students. The playlist format allowed teachers to string multiple titles together so that students were fully engaged in a listening station experience for a 10 to 15 minute rotation. QR Codes: Teachers were introduced to the wonder of QR codes, which can be utilized in multiple ways. Teachers were not only shown hundreds of free existing QR Code resources, but were also shown the steps to create QR codes (using a QR Code Generator) to help repurpose existing classroom titles by linking them to videos featuring the book read aloud. This allowed classroom teachers to recycle listening station books that had been damaged, or create a listening center from titles which previously had no other technology to accompany them. iTunes: For teachers who were interested in utilizing the listening station cassette tapes or CD’s that they currently owned, teachers were introduced to the use of iTunes. Using this computer-based program, teachers can import audio from CD’s and save them as digital files. This audio preserved the page-turn signals that typically accompany a book-on-tape, which provides an important guide for young readers. It also preserves the audio without fear of a CD being scratched or broken. These audio files can be pushed out to students via Google Classroom, or loaded to an Apple-based device (iPad, iPod, iPhone) for students to listen to the tracks along with text in hand. As the transformation of listening libraries was a technology-based initiative in our district, funds were available to support teachers in acquiring new materials. All teacher participants in the professional development training received two Chromebooks to be utilized exclusively for a listening station in the 2017-2018 school year. We recommended that teachers attempt to implement just one of the aforementioned ideas, rather than feeling overwhelmed by all four. All of the options provided were available at no additional cost to the district. Many teachers were able to implement the YouTube playlists right away, thanks to familiarity with YouTube as a teaching tool. Teachers found the playlists easy to create and easy for students to utilize independently because they were also familiar with YouTube’s layout and features. Teachers appreciated how playlists eliminate the need for students to “click around” to find the next video, and often saw fewer ads to disrupt the learning experience. Our teachers also began to use YouTube playlists at different times of the day, such as snack time and to support transitions. Many of our teachers loved the variety and ease of using QR codes. They were able to access hundreds of free, pre-made options online, which made the station available to use almost immediately with limited prep work. One difficulty our teachers found was that some of the premade QR codes were linked to videos that were no longer available, creating confusion for students. This inspired some of our classroom teachers to sit together during after-school hours to create their own QR codes and link them to videos that were available. After creating and printing homemade QR codes, some teachers even chose to tape it to the inside cover of the matching text from his/her classroom. This allowed students to follow along with the recording with the actual book copy in front of him/her, much like the traditional listening station format. To use any QR code, our students were taught to utilize the webcam on the provided Chromebooks. Students clicked the app to be utilized for a QR code scanner (this was pushed out through Chrome settings as an extra tab in a web browser), scanned the QR code, and clicked the corresponding link. Kindergarten Student using QR Code Listening Center. Panel 1 - A student logs on to the Chromebook and clicks the QR Code icon. Panel 2 - A student holds up the book to scan the QR code. Panel 3 - The audiobook version appears on screen. The primary key factor leading to the transformation of listening libraries was teacher training. Not only did teachers attend the summer informational session which outlined options for a 21st century listening library, but teachers utilized both of us as resources as they tried different options throughout the school year. Without training and troubleshooting, some of the great options and ideas could have been abandoned. Along with teacher training was student training! 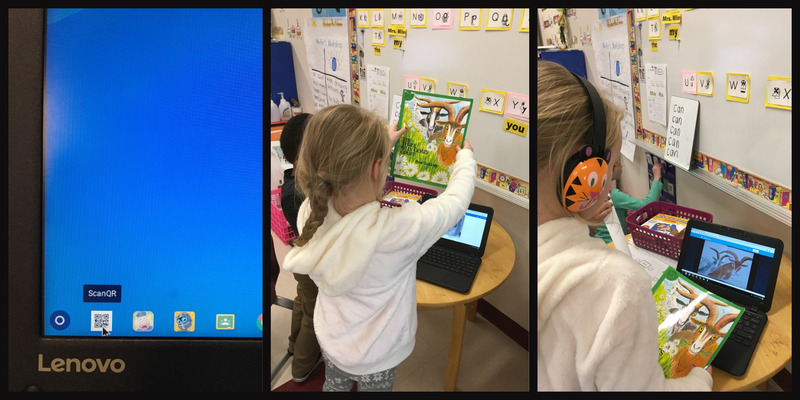 While even our youngest students were surprisingly adept at using a Chromebook, they had to be taught in small groups how to access each type of listening station (YouTube playlists or QR Codes). Taking the time to instruct the students in small group settings allowed for a higher level of teacher support and ensured that all students had an opportunity to practice with the technology before setting off on their own at an independent station. We are currently in our second year of implementation and have identified next steps to continue improving this listening library initiative. As websites and resources evolve, we plan to provide ongoing training to ensure that teachers are informed of the changes. In order to enhance this experience, we are now researching paid resources as teachers have found heightened value in the updated listening station formats. Some of these include safeshare.tv, Tumble Books, and BookFlix. Providing ongoing training also allows our teachers to share some of their successes and encourage other teachers to begin the transformation to a 21st Century listening library.